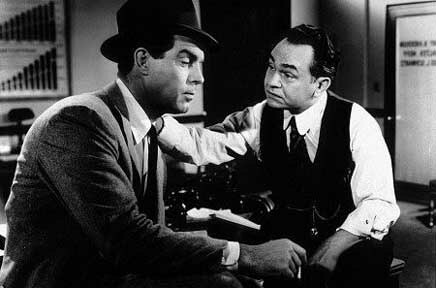 Starting today, DOUBLE INDEMNITY (1944) will be running at Film Forum in New York City for a week-long engagement. The following is what I wrote about it back in April, for my weekly Blu-Ray column here on Daily Grindhouse. 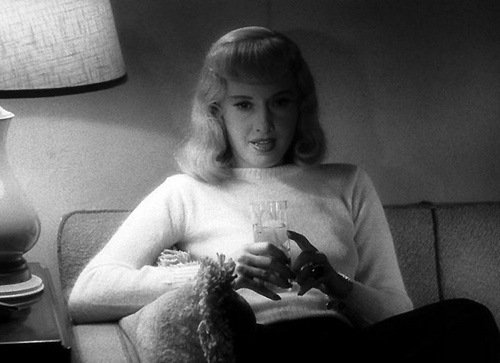 Seventy years later, DOUBLE INDEMNITY is still a textbook example of model screenwriting and storytelling — as are pretty much all the films written and/or directed by Billy Wilder, along with his many supremely talented writing collaborators. Wilder capably worked across tones and genres, and is probably most associated with comedy. But DOUBLE INDEMNITY is assuredly a film noir, based on a James M. Cain novella and co-written with Wilder by none other than Raymond Chandler. The stars are Fred MacMurray and Barbara Stanwyck, both normally better known for lighter fare — he more than she. MacMurray is famous for THE SHAGGY DOG and THE ABSENT-MINDED PROFESSOR for Disney, and for My Three Sons on TV, and he did forthright American-dad decency as well as anyone, but here, as the unfortunate Walter Neff, he dances with darkness. This and his role in THE APARTMENT, also for Wilder, are tremendous examples of playing with — and against — type. Brooklyn-born Barbara Stanwyck started as a dancer, but she projected an obvious intelligence beyond her physical gifts, and had a distinct knowingness to her persona. She was a hugely popular studio star, and worked for directors as varied as Howard Hawks, Cecil B. DeMille and Frank Capra, but in DOUBLE INDEMNITY she plays what many consider to be the most cunning and lethal femme fatale in all of noir. Maybe Stanwyck’s innate likability is what makes it so easy to believe that Walter Neff is so drawn in to her character, the very married Phyllis Dietrichson, and why her cruel streak is so disarming and hard to grasp, even when she’s pulling the trigger. Noir superstar Edward G. Robinson plays a supporting role here, and he’s brusquely appealing as always. The music is by Miklós Rózsa (THE THIEF OF BAGHDAD, TO BE OR NOT TO BE, THE LOST WEEKEND, SPELLBOUND, THE KILLERS, BRUTE FORCE, NAKED CITY, CRISS CROSS, THE ASPHALT JUNGLE) and the sterling cinematography is by John F. Seitz (SULLIVAN’S TRAVELS, THE MIRACLE OF MORGAN’S CREEK, HAIL THE CONQUERING HERO, THE LOST WEEKEND, SUNSET BOULEVARD). A crew of lifers, first-rate professionals, doing what they do best and in a couple cases, stretching what they do best, to great effect. There’s so much more to say, but I’ll stop here. This is an obvious recommendation to purchase. I said “purchase” back when I was talking about the Blu-Ray release, but now that there’s a chance to see DOUBLE INDEMNITY on the big screen, I recommend that even more highly!